How we 4X'ed our Pinterest Traffic in 3 Weeks! 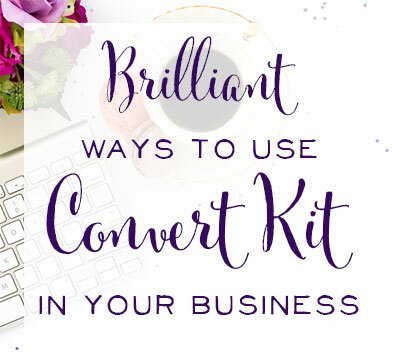 For those of you in the beginning stages of growing your blog or Etsy shop, or those who have a niche that feels harder to grow on Pinterest, this post is especially relevant! I can speak from experience now that any niche can gain new traffic from Pinterest, and it may not be in a way you considered before. I hope you'll be encouraged by our results, and realize that it doesn't take that one slam-dunk viral Pin to make Pinterest work for you. For a while, Sarah and I have been hearing all about the power of Pinterest Group Boards from the successful moms we've interviewed, such as Crystal, Ruth, Melissa, Jesenia, and Abby. Finally, I decided to get serious about Pinterest in 2015, so I eagerly headed over to PinGroupie to look for group boards in our niche. 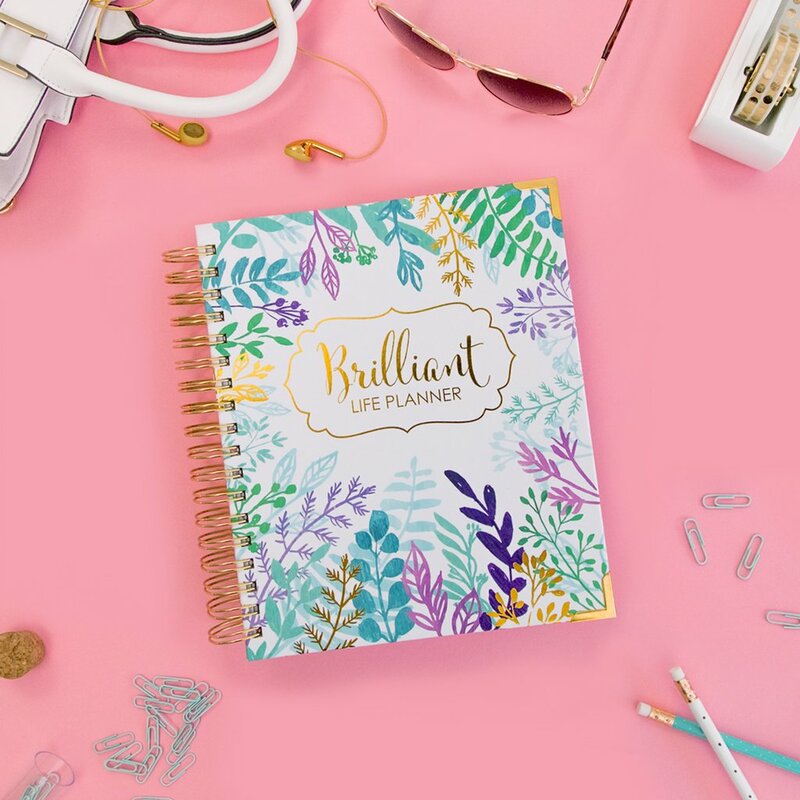 Besides a few small blogging advice boards and one for Young Creative Entrepreneurs, I was hard-pressed to find a fabulous group board in the business, blogging, or Etsy selling niche. I had heard of places where you could pin all your content every day, rinse, repeat, and do it again the next day for viral results. I did find the Top Blogs Pinterest Viral Board, and I highly recommend this board for everyone promoting content on Pinterest. The board is very active, so you can post a new pin of yours every two hours or so without it looking obvious. And the owner, Renae Christine , actually encourages lots of activity! 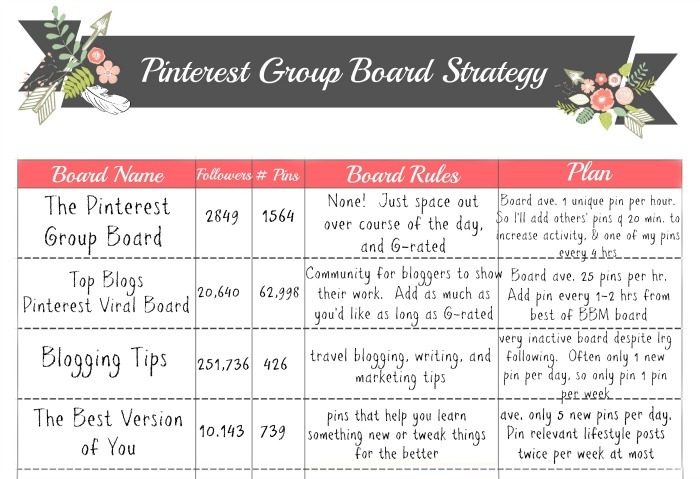 This was Step 1 of my Pinterest Traffic Plan: find group boards relevant to our niche, particularly active ones with large followings, and pin to them often. This plan did pay off to some extent. While we haven't seen a pin of ours go viral from a group board, we do see several hits come in from every pin. And all of those hits add up to a significant traffic increase over time. As I looked around and studied other successful bloggers on Pinterest, I realized that we were plum out of luck in a lot of cases when it came to Group Boards. Many mom bloggers write about household hacks, DIY projects, recipes, decor, party planning, budgeting, and many other categories. They can find and pin to a plethora of group boards on 20 different topics. Our niche of business advice for moms seems much more narrow on Pinterest. I knew that if I wanted to see some serious results from the site, I would have to get creative. I remembered hearing both Beth and Melissa say that being active on Pinterest had its own rewards. Like any social network, Pinterest doesn't want you to just promote your own content. They want you to be “social” So what does “social” look like on Pinterest? It means being an excellent curator and being very active. 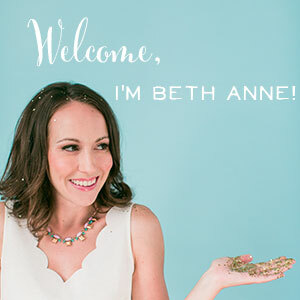 I was amazed when Beth Gambee shared that by being active on Pinterest (because she truly enjoyed the site) over a few years she had amassed 50,000 followers! (Beth now has over 76,000 followers just 4 months later!) What does active mean? Well, for Beth it means over 115,000 pins! Yes, Beth does pin to a lot of group boards, but she makes a point to be active on the site overall, and pin the content of others as well. For Melissa, being active means 21,000 pins (and she's now at over 286,000 followers!) Both of these women have became clear leaders on Pinterest in their niches. For Beth, it's baking. For Melissa, it's gardening. 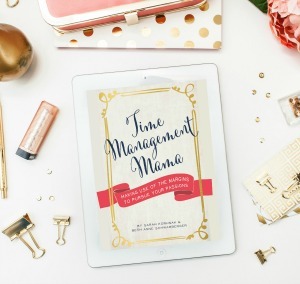 I decided right then and there that I wanted to amass the best and biggest collection of Etsy selling, blogging, business, social media, and marketing advice for women. Beyond that, I knew I could add boards on productivity, organization, home office spaces, and much more. So I got to pinning! I pinned more than 5,000 new pins in the month of January, to be exact. How did I do it? Did it take me 500 hours?! Nope, not even close. I averaged about 5 hours per week on Pinterest to get my 5,000 pins in one month. I used ViralTag to schedule out my re-pins and become an excellent curator. (FYI, this is our referral link for ViralTag. The link gives you $15 off ViralTag, and we get a credit on our account too. You can also try ViralTag for free for 2 weeks.) ViralTag costs us $24/month, but I can already see that it's worth it, and I've only just begun to harness its power. How does ViralTag Help me Crush it on Pinterest? Taking advantage of Pinterest's Smart Feed, I knew that the best content from every category would appear when I simply searched for it. So I searched for blogging advice, Etsy seller advice, productivity tips, and so much more. After searching, I used the ViralTag Plug-in To select the pins I liked and wanted to repin. Then, I spaced them out a few hours apart to pin great content to my boards a week or more at a time. 1.) Head over to Pinterest and search for a topic you'd like to pin, or search for boards on a topic you'd like to pin. When you find some good results, hit the red V in the right-hand corner to activate the ViralTag Browser Extension. 2.) You'll see a page that looks like the screenshot below. Notice that if you love everything on the board or page, you can choose to Select All. (This is also a convenient feature when you're scheduling out the best of your own content from your “best of” board to be shared on other group boards) Or, you can quickly go through and click on each pin that you like. A red checkmark appears in the top left corner of the pins you've selected. When you're done, hit the green Next button on the top right. 3.) You'll see a page like the screenshot below. Just select your interval for pinning (in minutes) pick the board (or boards) you'd like to pin to, edit descriptions as desired, hit schedule, and you're done! I love using the Bulk Editing tool to schedule out pins on the same topic to the same board all at one time. When I re-pin right from Pinterest itself, it takes me about 12 seconds minimum to find a great pin and re-pin it. I timed myself with ViralTag, and found that, for example, I can schedule out 24 pins to go to my Productivity Board, one pin every 4 hours for the next 4 days, in just 110 seconds' time. So even with just 24 pins, ViralTag cut my pinning time by more than half. The more I pin, the more efficient it allows me to be. For those of you who are new to Pinterest, you should know that even with Pinterest's new SmartFeed, how recent something was pinned still matters, which means you're still potentially at risk of flooding your followers' feeds if you, for example, pin 24 items on the same topic all at one time. Not to mention, by spreading out your pins over all hours of the day and night, you're increasing the chance of showing up in someone's feed at just the right time, because your pin may be the most recent one related to the topic they're interested in. Essentially, it is to your benefit to be pinning around the clock, day-in and day-out. I can set it and forget it with ViralTag, and my boards are continuing to amass great new content while I sleep or play with my preschooler. Think of it like Facebook's algorithm: you face less competition at 2 AM, so your post or pin may be shown to a few more people, if they like it and interact with it, that post or pin then gets bumped up even more. So yes, timing still matters a great deal on Pinterest. Once I got the hang of re-pinning, I decided to take things one step further. Most moms or even mompreneurs, are not likely to head to Pinterest to search for business advice. They head to Pinterest to search for recipes, DIY projects, style inspiration, and much more. They're real people, after all, with real lives outside of their businesses! I realized that, “hey, I'm a real person too!” Of course, I love it when I stumble across a great post on growing blog traffic, but when I'm “off-duty” I use Pinterest to snag recipes, workout tips, and to figure out which Valentine's Day cards my son Holden and I should make this year. That's when it hit me: there are so many mom bloggers on Pinterest. There are so many moms on Pinterest who have Etsy shops. And beyond that, there are so many moms who are thinking about starting a business on the side, but just haven't taken that first step yet. If I can be everywhere on Pinterest, I can get in front of all these great moms and let them know about our Podcast and blog. I started with a seasonal board on Valentine's Day, and y'all, I started pinning like a mad woman! I was determined to have the biggest Valentine's Day board on Pinterest that still looks GORGEOUS and inspirational. (Many large boards are quite clunky and unattractive.) I'm picky beyond belief when I pin. I try to mix things up with a variety of valentine cards, decor, recipes, outfits, photo ideas, and more. One thing I realized as I became more active on the site was that after I pinned something, Pinterest loved to show me another, related board that had that pin. Usually, the board they showed me had hundreds if not over one thousand pins. “I get it, Pinterest. You want me to take off my fuzzy slippers and drool over photos for a while!” I'm more likely to do that when you show me a large board with an extensive collection to explore. When I wasn't shown a big board, the trend seemed to be a board who had just recently pinned that same pin. So again, there's a trend here: Pinterest rewards those who have just been active on their site. Again and again as I pinned on Pinterest itself, I noticed a trend of re-pins immediately after I pinned on the site. I noticed just today, that Pinterest has changed their format a bit. Now, after I pin, a little box pops up at the bottom of the screen that says, “you may also like” with a recommendation for a similar board. I tested this with 2 Valentine's pins today, and both boards that were recommended were excellent in terms of beautiful content, and they both had over 300 pins. One board's most recent pin was pinned just 21 minutes before! Again, it pays to be an active and excellent curator on Pinterest. Here's a screenshot of the recommendation box that pops up after you pin something. You can click over to explore the board, or just start following it right from the box. My goal? Be that recommended board as much as humanly possible! Going back to the recommended large boards from Pinterest, as I hunted for Valentine's ideas, I decided that I wanted to be the biggest and baddest Valentine's Board around so that Pinterest would show my board to hundreds and thousands of pinners as they also collected ideas for Valentine's Day. This strategy worked like a charm! You might be wondering, “what's the point of pinning all that Valentine's stuff if your blog is about growing a business? Aren't you wasting your time?” In a nutshell, the answer is, “No, we're not wasting our time.” By creating the biggest and best boards on Pinterest, we get many new visits to our profile and clicks over to our site via Pinterest. Of our 4X increase in traffic via Pinterest, over 33% of that traffic came just from clicks via our profile. Pinning and therefore, sharing the best content in any niche that your ideal audience might be interested in is always a good idea. We've heard it from marketing gurus before: you can't just promote your own stuff and expect great results. 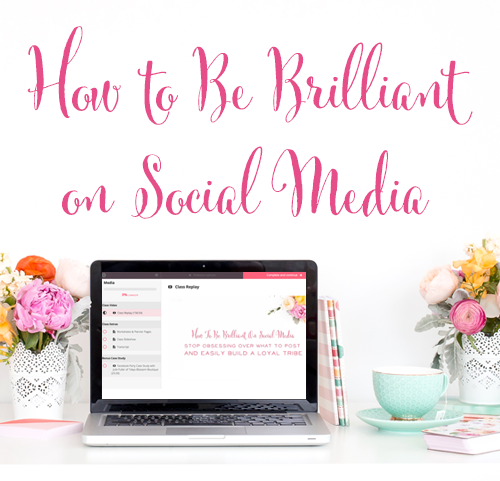 You need to be helpful and social on social media! You need to be seen as a curator of great content. This is exactly what Sarah and I are doing on Pinterest. I'll be honest with you. This strategy will certainly take more time than simply pinning your own content to group boards. But, this strategy is also a ton of fun! And, as our own following on Pinterest grows, it feels really great to be able to share the love by pinning other mompreneurs' great content. My Pinterest strategy takes the long view. I want Brilliant Business Moms to be seen as an excellent curator and worthy of following by other moms. I love that I can use Pinterest to help people “stumble” upon my content on other group boards, but I want to go beyond that. I want brand recognition. I want loyal followers. If you happen to be one of the few (or many! depending on how you look at it!) who blogs about DIY, recipes, kids' activities, AND frugal living all on the same blog, then chances are you're already getting tons of love from Pinterest because there are at least 100 killer group boards you can join. So what were our results from all of our additional Pins, Curation & contributing to some Group Boards? Join Group Boards and schedule your pins to these where relevant. Be active. Pin Others' Content. 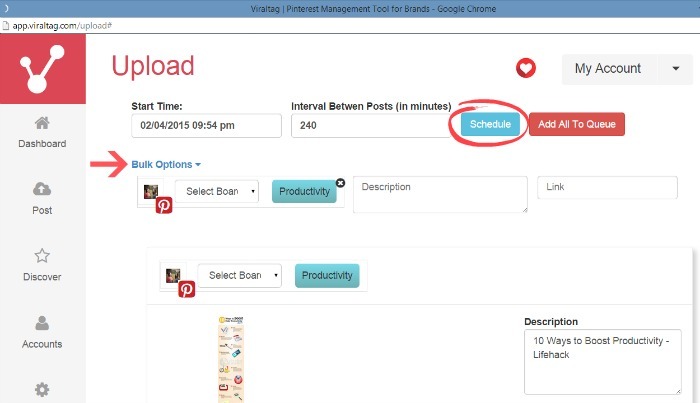 Schedule those Re-pins via ViralTag or another Pin Scheduler so you can strategically place great pins on all of your boards throughout each month. (Our goal = at least 7 pins/hour all month long every month.) How do you find great pins? 1. Search on Pinterest – the Smart Feed will do the work of finding great pins for you. 2. When Pinterest suggests another board where your pin can be found, and it looks good, follow that board, and go check it out. You may find a treasure-trove of related pins to re-pin. Create new boards both closely related to your niche, and those more loosely related. Your goal is to be seen as an excellent, and exhaustive curator. Whatever your ideal audience may be searching for and enjoying on Pinterest – you should also be pinning those things. Get on Pinterest itself and pin a few times per week. 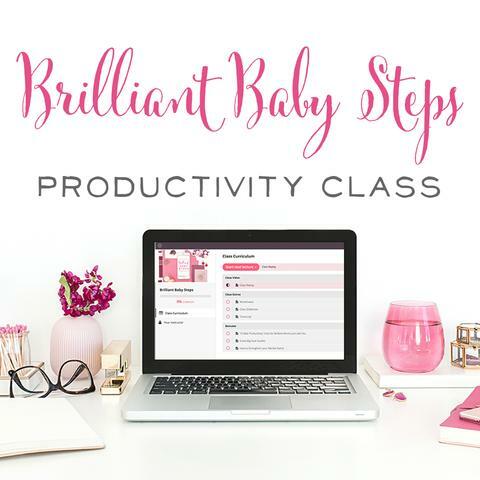 If all of this feels overwhelming, I've created two printables for you to help you as you develop your Pinterest Strategy. One is a Pinterest Post planner that allows you to keep track of your new content, and where and when you're going to pin it to other group boards or multiple boards of your own where it fits well. The full printable has room for 11 Group Boards per sheet. You could certainly keep track of all of this in a spreadsheet, as I have tried to do, but for some reason, my brain just works better with pen and paper. I like having my Pinterest planner sheets in front of me at my desk at all times. It's so easy to just jot down my plan for my newest blog posts, and also to make sure I'm effectively scheduling all the pins I can each month. The printables are available for all of our subscribers. Plus, some other great freebies on our secret page! To get in on the action, sign up here. 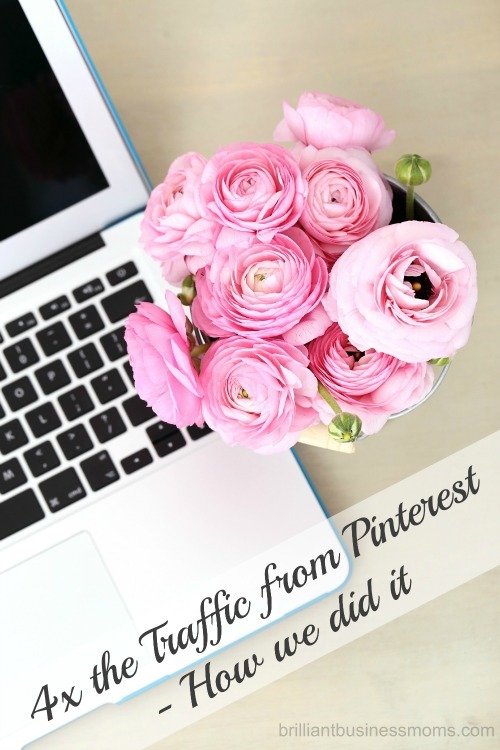 What are you doing to get more traffic from Pinterest? I'd love to hear about it in the comments! 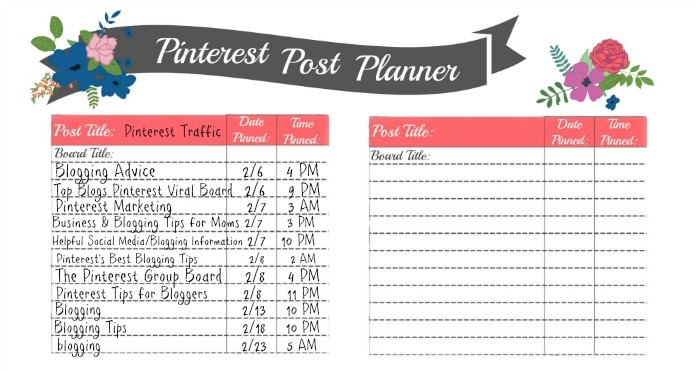 And don't forget to grab your free social media planning printables + worksheets!